MILLIGAN COLLEGE — Heath Shuler is quick to give Jonathan Crompton a vote of confidence. Shuler, a freshman representative from North Carolina’s 11th District, will eagerly watch Crompton’s debut campaign as Tennessee’s starting quarterback this season. 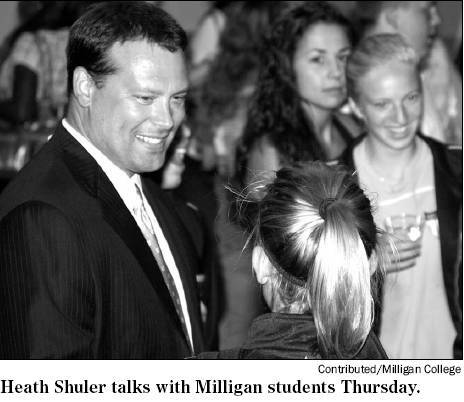 Shuler was in town Thursday night to speak at Milligan College in conjunction with Character Counts!, a character-education initiative in schools. Crompton did a little character-building at Shuler’s home while in high school in Southwestern North Carolina. Crompton and his prep teammates worked during the summer on Shuler’s property, including putting up fence for some 30 acres. Shuler said yard work wasn’t a labor of love for Crompton. Shuler said he and Crompton watched film together to analyze defenses when Crompton was in high school. Before bypassing his senior season at UT to become the third overall pick in the 1994 NFL draft, Shuler finished second to Florida State’s Charlie Ward in the Heisman Trophy voting. He was a dual-threat quarterback, as is the 6-foot-4, 220-pound Crompton. Crompton started at Arkansas in place of an injured Erik Ainge in 2006. His official era will begin at UCLA. The Vols began the post-Shuler era against UCLA in ’94, the game when fifthyear senior Jerry Colquitt was lost for the season to an injury. Shuler follows the Vols closely. He spoke with Tennessee staffer Conredge Holloway Tuesday and coach Phillip Fulmer Wednesday. He suggested Fulmer is cautiously optimistic about the Vols’ potential. The ability to reach it, obviously, hinges on Crompton’s right shoulder. Many would say the same of Shuler, whose second stint in Washington has gone much more smoothly than the initial one with the Redskins. The Blue Dog Democrat (fiscally conservative) defeated eight-term incumbent Republican Charles Taylor to get back to Washington in a different line of work, although football and politics have similarities. “It’s still a contact sport in a lot of ways,” Shuler said. He said he first started thinking seriously about politics while watching the furniture industry crumble in North Carolina. Retired Kingsport judge Steven Jones brought Shuler into the Character Counts! program years ago. Posted by tommy on August 22, 2008.